Ven. 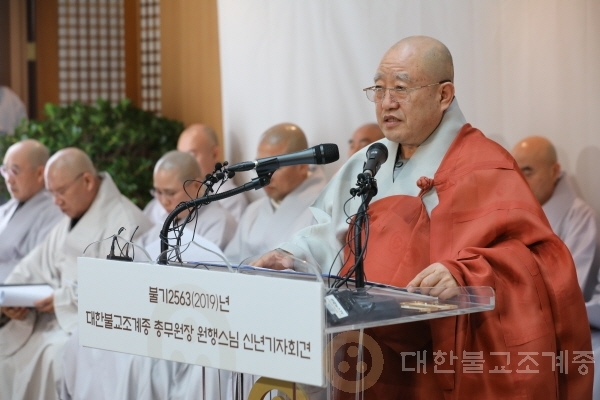 Wonhang, the president of the Jogye Order of Korean Buddhism, has officially declared the launch of the 36th Administrative Council, heralding a powerful beginning of an era under the banner of innovation and change at the New Year’s press conference held on January 16, 2019, or Buddhist Era 2563, in the 4th floor lobby of Korean Buddhist History and Culture Museum. 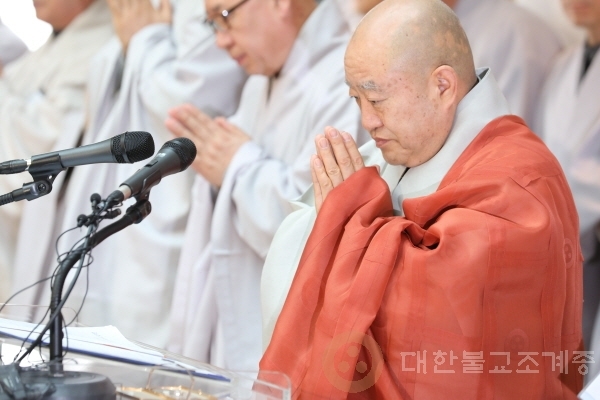 He vowed that he would be doing his best for the Buddhist community to contribute to the settling of a permanent peace on the Korean Peninsular and at the same time open a new chapter for the future of the Korean Buddhism through harmony and unity. First of all, the 36th Administrative Council will establish the Grand Centennial Project Headquarters as a central strategic base to ensure the Jogye Order’s future. Ven. Wonhang said that he “will make sure to keep my ears open so that no Buddhist voice would be left unheard and come up with a new direction needed to innovate and pass on to our traditional culture to the next generation, and added, “concerted efforts will be made on all fronts for the reform of spiritual practices and the successful propagation of the Buddhism. 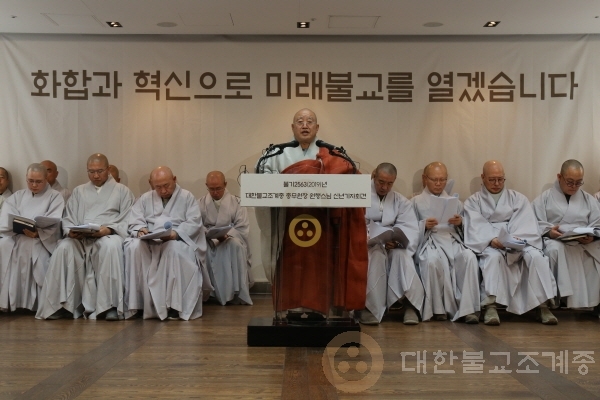 He also announced during the press conference that there will be major changes aimed to reform and reinforce the welfare system for the Jogye Order monastics. Ven. Wonhang stressed that one of the reasons for the very existence of the Order is to “support the monks and nuns so that they can practice and propagate the Buddhism without being hampered by hesitation or doubt.” In order to achieve this end, he said his team will conduct a nation-wide research on the current status of the monastics’ welfare system; draw up the blueprint for the creation of an innovative and comprehensive monastic welfare system; work together with regional districts to raise the order-wide funds; reimburse the full amounts of National Pension premium for all monks and nuns, and; support proactive health check-ups to provide improved preventive medical services. The South-North Buddhist exchange was another topic Ven. Wonhang has been committed to since his inauguration. He said, “Next month, a joint New Year’s event will be held in Mt. Geumgang, which I hope to serve as yet another opportunity where the Jogye Order can discuss measures to further cooperation and exchanges with our North Korean counterparts from Korea Buddhist Federation.” Included in the discussion will be installing templestay programs and South Korean monastics and the construction of facilities at Singye-sa Temple in Mt. Geumgang. One of the most immediate example of such measures will be inviting the members of Korea Buddhist Federation to coordinate Buddha’s birthday events together in Pyeongyang and Seoul, including lotus lantern festivals, congratulatory Dharma ceremonies and a lantern exhibition, where traditional lanterns from both the South and the North will be displayed. In commemoration of the centennial anniversary of March 1st Movement, the Jogye Order will host a variety of order-wide events such as Dharma ceremonies, bell tolling ceremonies and the seminars and conferences where the role of the Buddhism in the fight for Korea’s independence will be explored in a new light. Serve as wayposts for those who follow you.